The conclusion of last week’s Vehbi Emre tournament in Turkey, United World Wrestling’s final “Ranking Series” event of the initiative’s inaugural season, means that the top-4 seeds in each weight at the 2018 Greco-Roman World Championships are tentatively set. You say “tentatively” because it is all but certain several athletes in the top-4 of their respective weight classes will wind up not competing in Budapest. Since Ranking Series points are exclusive to individual wrestlers only and not the nations they represent, there is bound to be movement once the brackets are eventually constructed. 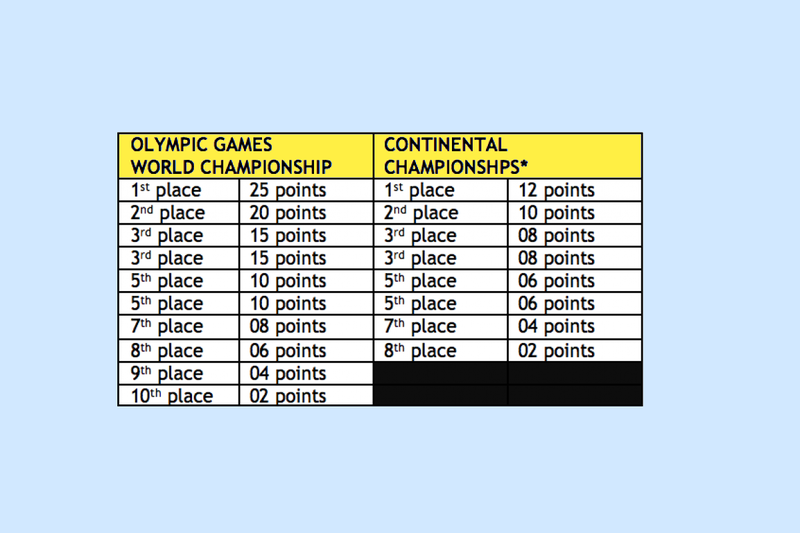 IF a wrestler who has earned points which result in a top-4 seed does not compete in that weight class for his/her country, that nation loses the spot and the seeds move up. But — this only happens pertaining to the top-4 seeds. Please see the images below for UWW Ranking Series point values based on event type. Note: number of athletes in bracket are added to point total for each event. 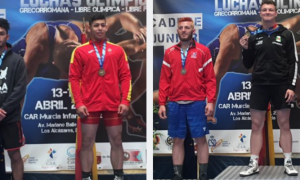 *All results/medals from 2018; numerical placings were not considered for listing but for one exception (Zarko Dickov at 82 kilograms). 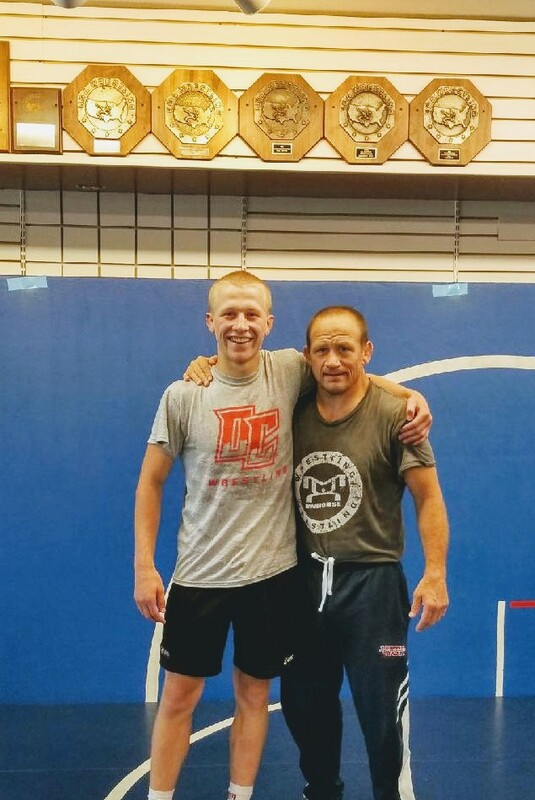 Over the weekend, 2018 US World Team member Dalton Roberts (60 kg, NYAC/OTS) visited World Champion/5PM Podcast co-host Dennis Hall in Wisconsin for some added technique and strength training. Roberts first became acquainted with Hall when the latter went up to Northern Michigan for a mini-camp earlier in the spring. Their time together previously had introduced Roberts to Hall’s SPIKE Core Training program, and the NMU athlete grew even more familiar with the SPIKE concepts during the Eagle Creek World Team camp two weeks ago. Now that Roberts is preparing for the more challenging training phases leading up to the Worlds in October, Hall feels the modalities the pair worked on will pay off at an increasing value throughout the summer. “I think number one, it’s about understanding how to use Core on your feet,” Hall said. “If you’re always in position there are a lot of opportunities to take scoring holds. When you’re in that position you feel very differently and can tell what your opponents are doing, and you can use that against them. That is going to help him. Another focal point Hall wanted to emphasize for Roberts was reinforcing his base. Not only does the 1996 Olympic silver medalist believe that a more robust foundation will fortify Roberts’s ability to attack, but also, improve his recovery time. As alluded to, it wasn’t all about boosting core strength and positioning. Hall wanted to get in Roberts’s head a little, too, and discuss some items which fall on the mental side of things, most notably regarding what to expect at the World Championships, when all of the opposition will be competing with a heightened level of intensity and not everything unfolds the way one might anticipate. “I just told him, you’re going to go down (in par terre) first at the Worlds and we need to make sure your defense is sharp,” Hall explained. “I just wanted to make sure they are focusing on defense and that part of the match, too, because being from the US, the truth is, we go down first almost every single match. 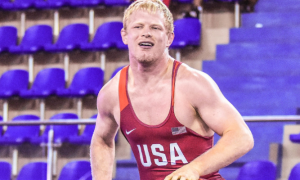 Together with Herb House, recently-hired Stanford University assistant coach Nate Engel will be presiding over the 2018 US Junior World Team that is slated to compete in Slovakia coming up this fall. Next Monday at the South Point Hotel in Las Vegas will begin a joint training camp featuring both the Juniors and Seniors. And unlike the Seniors, Vegas camp represents the first collective training sessions for the Junior squad since its formation last month. 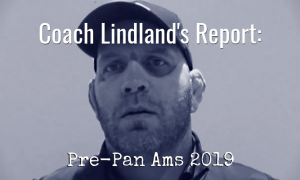 We caught up with Engel for a few questions in effort to get a sense of what the athletes will have in store along with the coach’s thoughts on team-building and limiting distractions. 5PM: You don’t have the same availability with the Juniors that exists among the Senior Team as far as accrued time spent together, but how much of an early part of this camp will be about the athletes getting to know one another? Is that at all a pressing objective? Nate Engel: Yeah, definitely. I think we have to do some team-building and get the guys to know each other because I think they can feed off of each other’s energy at the World Championships, and that will really help propel them to get on the podium and bring home a team trophy. That’s really important, so you want to make sure they mesh well and get along because we’re going to be spending a lot of time together. 5PM: We’ve seen this before, it’s a joint training camp between the Juniors and Seniors. How is this important and why is it important for the Juniors to be in the same training environment as the Seniors? Engel: I think it’s really important because I know that when I was competing the Juniors had a camp the same time as the Senior World Team members. I think it’s good to allow them to see what the Seniors are doing and get a chance to even wrestle with them. I think the Seniors can help the Juniors out as far as their work ethic. 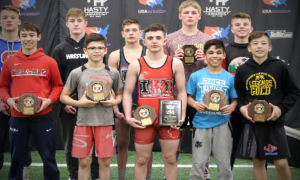 Plus, they (Seniors) are wrestling Greco pretty much full-time, whereas the Juniors aren’t wrestling Greco full-time, or as much, unless they’re from Northern Michigan. So I think it gives them an opportunity to see what the best guys in the United States at the Senior level are doing. It gives them an opportunity to learn and work on new things. 5PM: They are Juniors, so Las Vegas doesn’t offer too many legal traps to get into much trouble, but is there somewhat of a priority on limiting distractions? Engel: Yeah, I’ve had discussions with Coach (Gary) Mayabb a lot this past week and he has been talking about the game plan for camp. I think we’re going to be busy. We’re going to be watching a lot of film and breaking down some film on the foreigners, and just getting a good game plan down for the World Championships. Basically, just doing our best to get these Juniors ready for September in the next two weeks. So, I don’t think there is a lot of opportunity (for distractions). I think they are going to want to rest and be ready to peak at the right time in September. 5PM: Do you, the coaches, operate with baselines? For instance, it’s a short camp in Vegas but it’s an important one because of what comes next. How do you measure progress from when the athletes arrive to when they leave? Will there be ongoing assessments? 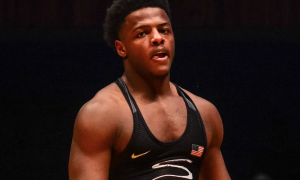 Engel: Coach Mayabb is going to have a lot of video cameras on the mats, he was telling Spenser (Mango) and I, so I think we’re going to watch that. 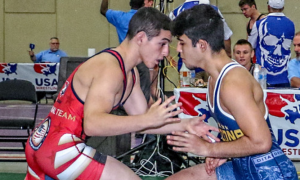 With the guys who aren’t full-time Greco and do folkstyle/freestyle and are coming in, I think we are going to see a lot of progress, because that’s all they’re going to be doing, wrestling Greco for two weeks. And then they can build a base off of that for when they go home so they can keep training after we get through Colorado and well into September before heading to the Junior World Championships. I’m sure we’re going to see a lot of growth from the lightest weight to the heaviest weight as far as their Greco. I’m just excited to see them grow, get better, and believe in themselves to get on top of the podium. 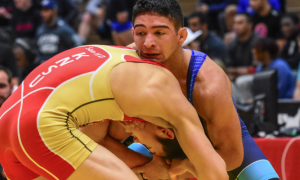 Yesterday, we zeroed in on how and why 97 kilograms is fast becoming a competitively healthy weight class for the US leading up to the 2020 Olympic Trials. For full athlete breakdowns, head over to here. In the meantime, a quick look at this video should help explain why this is one weight class deserving of your attention.